One of the best ways to seal a leaking crack in a concrete foundation wall is to use the Resin Injection Crack Repair and the Urethane Poly Foam Injection Crack Repair systems from Resch Enterprises Inc. Both the Resin Injection Crack Repair and the Urethane Poly Foam Injection Crack Repair is a basement wall crack repair method that is done from the INSIDE of the basement or crawlspace. This avoids having to dig down to the foundation on the outside basement wall. 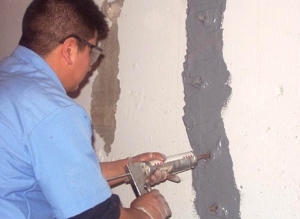 Our Resin Injection Crack Repair and the Urethane Poly Foam Injection Crack Repair systems are effective primarily because the resin or foam flows all the way through the crack from the inside of the foundation wall to the dirt on the outside. The resin/foam completely fills the void of the crack all the way through from top to bottom of the basement or crawlspace wall. Injecting the wall stops the water from penetrating the crack on the outside, similar to an outside crack repair, but without all of the cost/time of digging up the outside of the basement wall and disrupting the landscaping. The resin that is injected has low viscosity and great fluidity to it, which makes it great for hairline basement wall cracks because it can still easily flow all the way through extremely narrow cracks. Epoxy also adds to the structural integrity of the wall as well by essentially welding the wall back together, making it one solid wall again. When cured, the epoxy hardens to a solid state that bonds tenaciously to the concrete and forms a repair that is harder than the concrete itself. For larger cracks a medium volume or heavy volume epoxy can be used to inject the cracks. Urethane crack repairs are better for larger cracks that may experience some future wall movement. The urethane is an expanding foam that expands to fill all the nooks and crannies of the crack after it is injected. Urethane poly foam is extremely flexible and provides a long-term bond to cracks that will not separate when subjected to typical forms of future wall movement. Both the epoxy and Urethane Poly Foam Injection Crack Repairs are an affordable and effective repair to any leaking concrete wall crack.